Here are the next couple of outlined chapters. Extensions are the next pillar of good technique after the shift into 4th position. It’s easy to go awry when doing this technique, so the pictures are especially important. The ones I have included in the sample chapter are not final, but indicative of the detail I want to include. I may even want them larger, and the focus pulled out further to show the entire arm. As I said in my introduction, I was a lousy student. I was very resistant to changing my technique, and as a result nearly ended my career with the ensuing parade of injuries this caused. This chapter is all text, and it offers substantive information relating to my experience and that of my students. I end with what is a sort of mantra of mine: relaxed playing isn’t something that happens in addition to good technique. It is the essence of it. More extensions, but this time, we take the technique down the neck instead of up it. I am trying to prime the students for things that they will likely see in the beginning months of study. After we play in G, it is common to progress to D. After D, we see etudes and pieces in F. I am following the standard, accepted guidelines of most teachers I have had and spoken to. This curriculum is widespread. I like to introduce some elements of “advanced” technique earlier than some. A lot of people hold off, and then things like shifting, extending, harmonics, and tenor clef are steeped in mystery and appear impossible to accomplish. I have found great success with this method of presenting information with my own students, who are among the most varied clientele one could imagine: young professionals, college prep students, hobbyists, the elderly, and the very young. Being able to find the same note multiple places on the cello not only expands the amount of repertoire available to the student, but also the amount of finesse with which they play. It’s important to address this relatively early on, because I find that the most common reason for quitting is that they feel disconnected from the instrument. 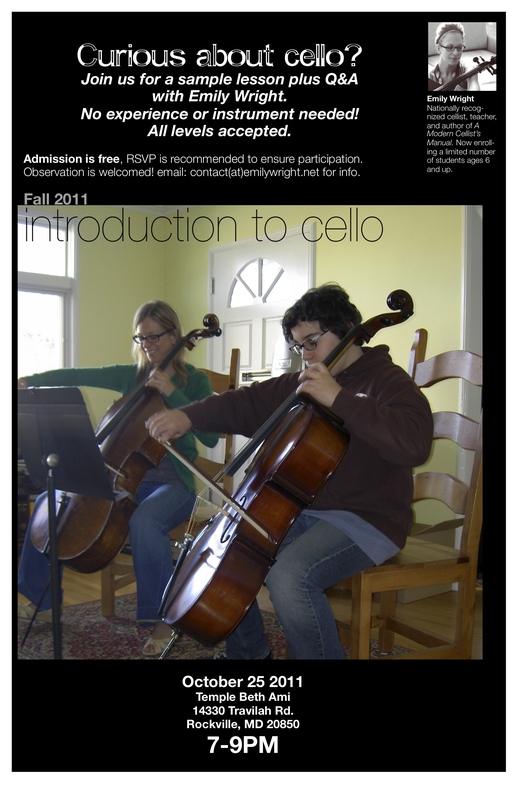 They can get notes, but the whole reason anyone takes up the cello is because of the sound. That sound is a result of years of work, to be sure, but if a student is able to see even minute improvements in tone, then they are more likely to stay with it and achieve meaningful progress. So this chapter is one facet of left hand finesse. This was the first chapter I ever wrote, in frustration, as there are few books intended for the cello to learn tenor clef. Most of the texts out there are geared towards the euphonium or trombone. There is allegedly one from Faber, and another from Spartan Press (though the catalogue number looks like HL). I could have written a book exclusively about tenor clef (and if you would like me to, by all means, there is a need) but I wanted to give a primer and let the teacher then prescribe etudes and pieces that were appropriate for the student’s level. This is a how-to, not an in-depth academic exploration. Students learn by doing. This book primarily deals with the manner in which they do. Each chapter builds on the one preceding it, if a student is starting at an early level, but it is also possible to intercept a more advanced student and continue midway. There are no books out there that address vibrato, tenor clef, injuries, or obsessively emphasize the need for good technique. If I found this book at a music store, I would think I had found the jackpot because of chapters like these. Keep in mind this was something I wrote to sell my concept. I apologize if I come off with anything that resembles hubris or bravado. I have found that if you pitch something in an apologetic way, it doesn’t even get considered. Getting out all the rot. I kept that in mind today on my 3 octave Ab major scales. Oh, it’s humbling to confront the rot. I tense up and rush on the upper notes. Ok, it’s time I got rid of it. BTW, some might ask, how is this different from the Louis Potter book? It’s clear already in some ways. I happen to think more highly of Potter than some others I know, but I think Potter’s does leave some to be desired. I’ll be interested in what you write about injuries. Have you read “Playing Less Hurt”, also written by a cellist. It is not specific to cellists, though; it is for all musicians. Sheesh, my above comment looks weird. I was just trying to say I practiced with special attention this morning to get rid of some of the “cavity.” I can’t cover much ground that way, but it does leave one with a feeling of accomplishment. On tenor clef books, I used the Faber book “Learning the Tenor Clef: Progressive Studies and Pieces for Cello: when I was learning tenor clef and I thought it was quite good. The pieces started out easy and got progressively harder. It was very helpful to see the notes written out to begin to imprint them in my brain. My teacher had me start playing tenor clef very early (I think I had only been playing less than 6 months; also I asked since I was running into it in orchestra) and now I don’t have any problems with it. Treble and that false treble is a different story, though! Also, I haven’t used the Potter book. I have looked through it, and I find that the biggest overlap is in the intention behind the book, not the way I go about explaining it. His book is a little stuffy and in need of updating, and has a more scholarly, academic voice. His goal, though, is mighty, and I have ordered a copy in the hopes of learning from it. Thanks for the suggestion. Do you teach fourth position before extensions, Emily? I’ve just been learning fourth position in the last few months, and I learned extensions quite awhile ago. I really struggled with extensions. That should present tense! Backwards extensions are fine, forward extensions I don’t know, I never feel confident. Which is silly as the hand shape should be so similar… or so I’ve been taught. I was taught 4th position early, well before extensions. I think it’s helpful for avoiding that common beginner’s disease, first-position-itis. I found my 4th finger on forward extensions wasn’t right until I was confident that fingers 2 and 3 were right. 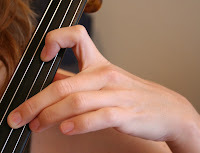 Like B, C#, D on 1st, 2nd, 3rd finger. I see the photo with this post shows that “other” type of extension, the pronated one, where second is extended instead of first. Some strongly disapprove of it, but I like having a choice; the pronated one is easy on the hand muscles, sets one up nicely for 1,2,1,2,1,2,3 type scales, but not so helpful if I need 4th finger, especially on the next lower string. I’ve written about this on CBN, but they think I’m crazy (Ok, know I’m crazy). So Emily, is that a picture of how to do it, how not to do it, or one of the options of how to do it? It is an option. And in fact, if you want the truth, that picture is not even going to be in the book, because of the larger than average pronation and the teeny bend in the wrist. I teach two kinds of extensions: the stretch and the pivot, and I’ll write a post about them later on today or tomorrow. My teacher adheres to the Suzuki method with one exception. She started me working on third position shifts at the same time I began practicing shifting to second (same with the various extensions.) So when Suzuki finally started third position, I was ready. Now that I’ve started fourth position, I find I’m able to move all around with (relative) ease. Seeing as the Suzuki approach is followed by many teachers, will you include a discussion of it in your upcoming book? also, with the injuries, sounds like a great anecdotal experience to include, what advice do you plan to give for that? Are you familiar with Margaret Rowell and/or the Alexander Technique? And thanks for the shoutout! Comine across this blog has been quite inspiring!